If you are looking for a small recliner chair, the C1 Petite should be your first choice. For a smaller person, a standard riser recliner chair will be too wide and not provide the level of comfort required. There are surprising few small recliners available on the market, luckily enough the C1 petite perfectly fills that void. The C1 has a simple to use rocker switch style remote control that will make it easy to use for people with limited memory function and those with dexterity problems such as arthritis. This small recliner chair has a battery backup in case of a power cut, this means that if you happen to lose power the battery will kick in and allow single use recline or stand function. This battery backup is powered by a 9v (smoke alarm) battery that is designed for single use. The C1 petite has been around for a long time, and for good reason. It has excellent reliability and is very popular with customers. During our tests we found that the C1 petite has a superb recline function and actually laid back further than quite a lot of the other chairs we have tried. The upholstery is truly beautiful and very comfortable. The burgundy is especially nice and we have seen chairs that are some years old that have shown no signs of wear in the material. Overall if you are looking for a small recliner chair, we recommend the C1 Petite as our number one choice. 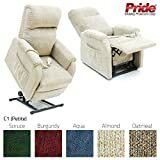 Where to buy the small recliner chair (C1 Petite)?